My husband jokes all the time about the “mom mafia”. I do not think you really have to be a mom to be a part of this tribe. It is really a woman thing. A relationship thing. Whenever one of us experience a trial, hard-time, health issue, our women tribe move into action. There is food…..so much food. Of course there is also a listening ear, help with carpool, and general rally so no one is alone…but there is always enough food! I know I have amazing friends. It is hard not to feel it when you put yourself out there in this type of work. The women around me encourage me, challenge me, and are genuinely interested in how life is going. It is a two way street. I love celebrating the successes of my friends, big or small! Stay-at-home, work-at-home, traditional work – those labels do not matter. We thrive when we have a tribe of women surrounding us in all seasons of life. Never is that more true than when a trial hits. This past week I travelled back to my childhood home. Momma was in the midst. You go when it’s your momma. Right! Although, the health issue is on the mend and the light is so much brighter than we thought it would be..they came. They came out in a mighty way. It is interesting to see a generation of women different than your own surround their friend in her time of need. I have always known my mom’s friends were amazing. They have even thrown me out of town baby showers! So much love! This particular week the tribe came with hands full and hearts wide open. So came the food. I am sure my parents will not have to shop or prepare food for over a week. It is so great. Especially when I had to leave and come back to tend to my own family. I know she is in good hands. Culinary skilled hands! How do we cultivate such an amazing tribe of women? Years? Well these women surrounding my mom all met at work! My mom started back to work in an office when I was in high school. So some are friends that have been there since I was a baby, then there are the friendships cultivated from 8 hour work days and conversations around the lunch table. Sick times, vacation times, job changes…they have shared it all. The time we spend sewing into others from our own abilities is all it takes. It does not have to be elaborate or cost a lot of money. Go fold some laundry for a friend, run errands for them, babysit their kids….do it before they need it. These ladies showed me how precious what we build now is in the future. There will be a season when surgeries and health scares could be more frequent than they are now. Life is so much more rich and full with the relationships that invest in us and us in them. And the food is so much better when someone else prepares it! Share with us in the comments about your own tribe. How do they invest in you? How do you bless them ? I have a tribe of wedding professionals that give me life at times. It is so hard being a soloprenuer at times. Having your tribe revives you. Moving often and working from home makes tribe cultivation a challenge. I end up with smaller tribes, but in more places. But your post is reminding me to put more focus on relationship building wherever I am. Thanks for this important reminder! Honestly, I need to invest more in serving a tribe where I live now. I did have a huge trial in my new(ish) area, and so many kind women brought meals for my family. It meant a lot to me. My Mom Tribe are the women from my new mom support group. More than 4 years later, they are some of my closest friends and confidants. I live in a place that is very transient. So most of my good friends have moved away which is sad to me. But it’s great how women can support each other. And we should always lift each other up, not bring each other down. Surround yourself with people that celebrate you not tolerate you. This is always the hardest part of finding a true tribe. My tribe could use some work. It seems to be a bit scattered at the moment. Everyone moving or basically life just getting in the way. This is so wonderful and all true! Once you find the right tribe hat usually ties you in with some like minded things we look after each other and would do anything! Your mom is lucky! Having a tribe is great support network. It’s not something I’ve made a priority and put the time into yet. First off, let me say that I may just have to steal that “Mom Mafia” title for my friends. Hilarious! There is something amazing about the tribe of women you surround yourself with. I unfortunately have dealt with some major life moments in the last few years and the BIG, HUGE silver lining to my cloud was always my tribe! They just show up, no questions asked. They are just there (always with food). Your tribe reminds you of the light and love that this world still holds even when times seem dark. Cheers to your tribe and your Momma’s! Oh it is so important to have a tribe! Life is tough and we all need people to get through it with!! Definitely love to help run errands when I know the burden is heavy for them. Tribes are so important!! This one sounds fabulous!! You are so lucky!! 🙂 Thank you so much for sharing this!! I have a tribe of friends that work with me and without their support I don’t think I would be where I am today! I love the saying “it takes a village to raise a family” because it’s so true. Thanks for sharing. Love this! (And the Mom Mafia!) I don’t know why it seems SO much harder to actually find a tribe once you become a mom, but it really has been a struggle. I guess that awkward gap caused because now your childless friends don’t want to hang out with a baby in tote, or because your friends have babies before you, and you’re the odd girl out…something causes so many tribes to fall apart around this time in life. I’m putting one back together now though, and loving it! My friends and I live a little further away now that I moved to a new city, but we are still each other’s biggest cheerleaders. Oh, and food is always a big part of our gatherings…lol. I hope your mom is ok.
I’m lucky enough to have a tribe that supports me, too. I think it just happens naturally. We’re all in this together. Once becoming a mom, we realize how many struggles we all share at different points in our lives and it helps to know we’re not alone. What a heartfelt post! I love reading about people coming together and it sounds like your tribe came out in force. Every woman needs a tribe! And yes, sometimes it is ALL about the food! Food is one of the greatest ways we serve and love others. Thank you for acknowledging that food does not have to been hours in the kitchen creating a homemade feast. The intent is to love. My tribe is definitely people that I can count on. It’s amazing when you have these people in your life! 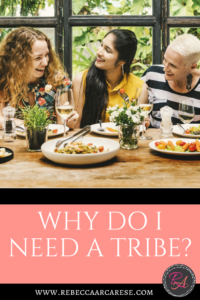 To be honest, I have a lot of female associates (coworkers, blogger babes, best friend, sorority sisters, etc), yet I still don’t feel like I have an actual tribe. And it’s not because of them. I feel like I don’t do as good of a job as I could at cultivating friendships with other women. I’m not proud of it and it’s definitely something that I have to work on. Thank you for sharing! Thank you for your vulnerability. In August, I will be talking about friendships. 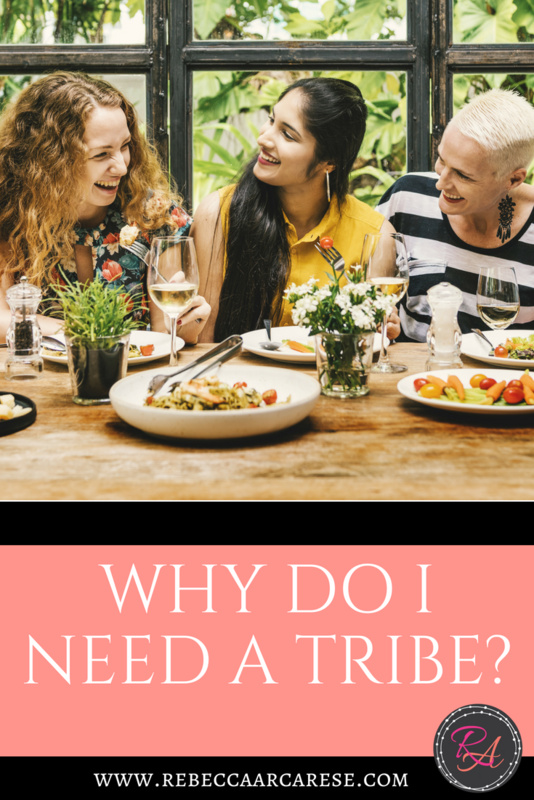 I think just “going out there and find your tribe” is so much more than simple! It can be very painful. I would love to hear from you more! Feel free to email me a story or an update! Really routing for you to find that one person that can be your cheering section!